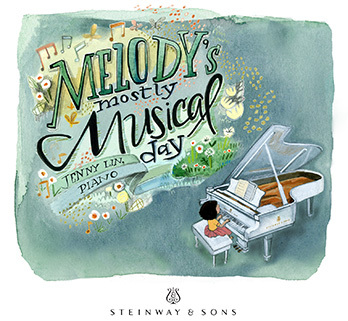 Steinway & Sons recently published an illustrated SPIRIO playlist for children and family members to enjoy! The lovely collection of classical piano works are performed by renowned Steinway Artist Jenny Lin. The album, Melody’s Mostly Musical Day, follows the life of a child from breakfast to bedtime, told through effervescent music and captivating pictures illustrated by Mikela Provost. Melody moves through her day playing with butterflies, enjoying icecream, walking her dog and of course practicing piano in the afternoon. After an adventure with spaghetti and meatballs, Melody retreats to her bedroom where plays with her dollhouse, a miniature white piano and enjoys a beautiful view of the night sky. She dreams of sleeping outside in a bed of flowers with the moon smiling down on her. The delightful compilation encourages children to find their own joy and playfulness in classical music. The album includes music by Tchaikovsky, Mozart, Prokofiev, Poulenc, Grieg, Brahms and Chopin.